It's been a while since I've posted anything up. As I take all of December off work I was expecting to get a lot of painting done. Unfortunately the opposite was true and I got very little done. 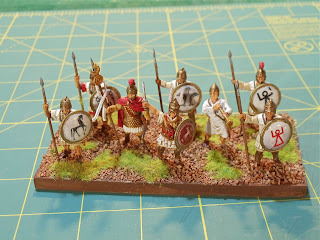 I did finally complete my Carthaginian Libyan spearmen as show below. 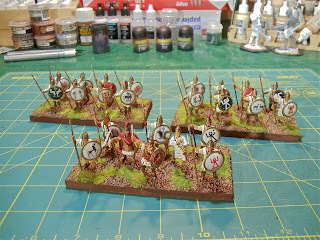 Figures are all plastic Victrix from their excellent Warriors of Carthage boxed set. Shield transfers are predominantly Little Big Men Studios with a handful of Veni Vidi Vici thrown in. The LBMS are really nice but were a pain to put on the domed shields. My application of them was less than stellar but at arm distance they look good. I also finished up an old GW terrain piece. I believe it's supposed to be some sort of crashed flyer/gunship thing. It can easily function as some sort of crashed spaceship. Recently I picked up a copy of Amerigo from Queen Games. 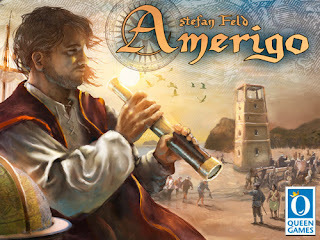 I played this game at Fallcon last year, so I've had my eye on it to pick up for a while. In the game you have your goal is to establish trading posts and little colonies all over the randomly generated map. A turn is composed of a handful of phases in which you pick one action to carry out like: construct buildings or move your ships. What actions you can take and how many of them are defined by a neat mechanic of using a dice tower, or in this case a small cube tower. It was this mechanic which probably drew me to the game. I know they use it in one of their other games: Shogun. Overall, the game went pretty quickly and once you've played it for a few minutes, you'll have it mastered. 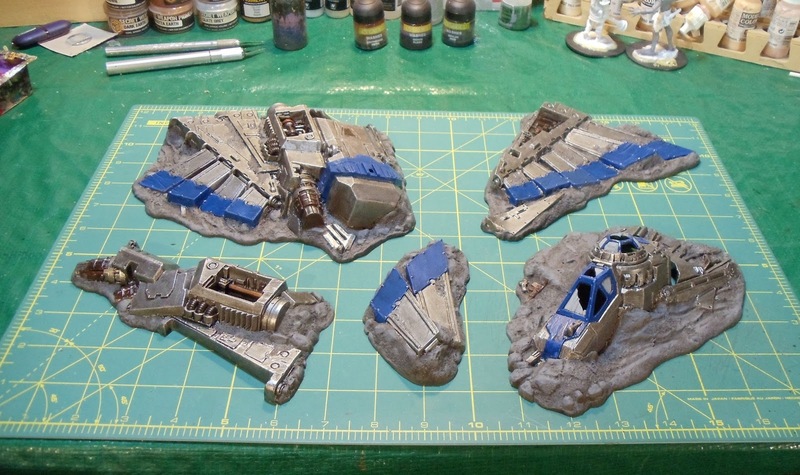 On my paint table right now is the last fleet for War Rocket, the Valkeeri. I was hoping to have these down this year but I doubt I'll get them down in the next day. After that I'll probably do some more ancients. And I'll have a 2015 review in a couple days.